The challenges of the 21st century require new ways of thinking, making it crucial for educators and policy makers to understand the processes of creative thinking and achievement. Even the developed Western countries are straining under the stress of changing economic realities. None of these challenges can be solved alone, they require behavioral change. Emotions are central to all art forms, from painting and sculpture, to music, film, theatre and other arts. Emotional intelligence abilities are important in how individuals navigate through the challenges of creative work. They are necessary to transform emotions into motivators of creative activity. Engagement with the arts, both as art appreciation and art creation, can be a powerful teaching tool in increasing emotional intelligence abilities and creativity in one’s everyday and professional life. This article focuses on the role of emotions in the creative process and how the Arts can be a medium through which people can learn to use and manage their emotions to foster daily creativity. Innovation and excellence in all domains of human endeavor, from scientific research to business entrepreneurship, are filled with frustration at many missing links, puzzlement at the unknown, excitement about new problems to examine, and the elation of eventual success. Creativity and flow are linked to better job satisfaction, higher-quality leisure time, more positive emotions, and greater overall well-being and happiness. The good news is, everyone is creative and everyone can nurture their creative side. Creativity is certainly involved in making art. However, creativity is much more than that. Without it, we wouldn’t be able to work or solve problems in our daily lives. All people have the capacity to be creative. We can also nurture and increase our creativity. Creativity is less likely to be present with negative emotions such as fear, anger, sadness, and anxiety; it is positively associated with positive emotions such as joy, love, and curiosity. The ability to be fascinated and allow ourselves to explore and discover makes us feel open and alive. It is also what draws us to learn new skills, perspectives, ideas and resources that we can draw on to solve life’s problems. When psychologists are interested in studying creative people, they want to learn who are the creators – what they are like or how we can describe their traits, skills and life experiences. The study of the creative process answers how a person thinks and works – how they discover problems worth pursuing, how they approach these problems, and how they address them. Finally, creative products can be ideas, performances or items created by individuals or groups. The generation of products is key in discussing creativity, without it, we are talking only about imagination that does not take flight. In spite of the challenges in defining creativity, psychologists have devised ways to study creative individuals, their creative process of creation, and the ideas and products they create. This research points to four ways people can be creative (Kaufman and Beghetto, 2009). At the most basic level, there are creative moments which might only be original to the individual, such as when a child experiments with building blocks. Then, there is everyday creativity which is evident in interactions and activities of daily life, such as when one is playing music with friends or when devising a way to help a child struggling with homework. More skill and knowledge is necessary for professional creativity. For instance, a teacher who develops a curriculum to teach kids how to resolve conflicts with peers or your cousin, who opens a restaurant fusing Spanish and Italian cuisine, both show professional creativity. Finally, eminent creativity describes individuals who change a domain of work or even a culture at large, such as Albert Einstein or Bill Gates. We are especially interested in creativity that both contributes to society and is accessible to large numbers of people, everyday and professional creativity. Knowledge and thinking skills are crucially important in the creative process. People have to be able to come up with many different ideas and imagine possible solutions to challenging problems. To do that, they usually need extensive knowledge of a domain of work. Knowledge of electrical engineering, for example, is necessary if one is creating a design for an electric car. But the creative process is also fraught with emotion. Scholars agree that there are several common steps in the process of creation (Amabile, 1996). A person has to identify a problem, gather the relevant information and resources, generate ideas, evaluate the value of the ideas, and finally decide whether the process is complete, needs to be repeated or should be abandoned. These steps are not linear and occur in varying orders, such as when learning or preparation leads to recognizing a problem. Emotional creativity is an ability that significantly predicted involvement in the arts. This ability was more strongly related to artistic expression and appreciation in performing arts than to artistic activity in writing and visual arts in which the expression of emotions is not always necessary. Also, cognitive abilities and personality traits in creativity, self reports of emotional creativity are more strongly related to artistic creativity than were ability measures (Averill and Thomas-Knowles, 1991; Barron and Harrington, 1981; Feist and Barron, 2003). The relationship between emotional creativity and creative behavior could be better understood by employing criteria that address expression of emotions in real-life creative production. Such criteria might inquire about the content of artwork or attributes of style in artistic expression. Hence, any artwork concerned with expression of emotions would benefit the most from original emotional experiences. According to Greenberg and Baron (2002), our everyday feelings, reflected in our emotions and moods, play an important role in how we think and act. People’s judgments and decisions regarding others and events will be “heated up” by their emotions (Forgas, 1991; Kunda, 1999). That is, their structures, strategies, and modes of processing can be coloured by their affective system. The affective system is a broad term, consisting of interpersonal evaluations, emotions and moods. According to Fiske and Taylor (1991), interpersonal evaluations and moods are affective states that are simple, long-term positive or negative feelings. The distinction lies in that interpersonal evaluations are in response to a specific target, whereas moods are not. Mood can be defined as an unfocused, relatively mild feeling that exists as background in our daily experiences. Moods are more subtle and difficult to detect than the emotions we are sure to recognise. You may for example say that you are in a good or bad mood, but this is not as focused as saying that you are feeling sad or experiencing fear. Emotions are, in contrast to interpersonal evaluations and moods, highly specific and intense. Emotions are complex, relatively brief reactions involving physiological responses, subjective states, and expressive behaviours (Fiske and Taylor, 1991; Forgas, 1994; Greenberg and Baron, 2002). Emotions can be defined as overt reactions that express feelings about events (Greenberg and Baron, 2002). Emotions always have an object: there is always someone or something that caused or triggered your emotional reaction. Second, there are six major categories of emotions. We do not have an infinite number of different emotions. Research (e.g. Weiss and Cropanzano, 1996; Greenberg and Baron, 2000) has shown that emotions fall into six major categories: anger, fear, joy, love, sadness, and surprise and of which the first five can be divided in subcategories (see Figure 1). Third, the expression of emotions is universal. People throughout the whole world generally portray the same emotions by using the same facial expressions, making it possible to recognize other peoples’ emotional state. Fourth, how and when people express emotions is determined by culture. Despite the previously stated fact that people throughout the world express their emotions in the same way, informal standards or cultural norms govern the degree to which it is acceptable for them to do so (Greenberg and Baron, 2002). Emotions guide people in appraising social situations and responding to them (Fineman, 1997; Antonacopoulou and Gabriel, 2001). Emotions can be positive (pleasant and exciting) or negative (unpleasant and disturbing). This depends on interpretations given by individuals and tested through their relations with others. Emotions are thus coping mechanisms, that enable individuals to adapt to changing circumstances. In this manner they function to preserve what a specific individual values in different circumstances and at the same time signals when there is a need for change (Antonacopoulou and Gabriel, 2001). Emotions are relatively intense affective states that interrupt ongoing thought processes and behaviours. Emotions signal people where they need to focus their attention and place them in a state of readiness (Frijda, 1988; George and Jones, 2001). Emotions are triggered by events that are novel or unexpected and personally relevant. They arise in response to events that are important to the individual and which importance he or she appraises by the direct implications the event has for the personal goals or strivings. Events that for example satisfy or promise to satisfy the personals goals, yield positive emotions; events that threaten or harm the concerns of the individual lead to negative emotions (Frijda, 1988). Emotions thus provide a signal that there is something that is personally relevant in need for attention. This signaling function of emotions is complemented by the motivational implications of emotions: emotions motivate cognitive activity and behaviour in order to deal with the emotion triggering situation (Frijda, 1994). We are however not fully aware of how our emotions shape the work relations we are in. The relational theory of emotions provides two important insights on how emotions are intertwined with processes of organizational change. This theory helps us in understanding the complicated functioning of human beings in the processes of organizational change (Ashforth and Humphrey, 1995; Doorewaard and Benschop, 2003). According to the relational theory of emotions, a person’s actions and intentions do not only stem from their rationality, but are always and inextricably bound up with the emotions he or she has. Also, emotions are seen as being both individual characteristics and features of the power based relationships between people involved in organizational change. Emotions thus function as implicit subroutines or feeling frames and they do so in non-neutral, often prevailing power processes (Doorewaard and Benschop, 2003). Looking at emotions as subroutines, it is important to note that the emotional influence usually takes place between the levels of consciousness and unconsciousness, also referred to by Giddens (1984) as the twilight zone of people’s “practical consciousness”. Still, whatever the situation, emotions play a different, but always decisive role, portraying how the people involved give meaning to what happens in their organisation (Doorewaard and Benschop, 2003). This has been the topic of much research in recent years. The results are, quite confusing but two points are worth mentioning because of their consistency. First, persons tend to be more creative when in a positive mood. The implication seems clear: If you want to encourage creativity in a person, do him or her a kindness. Unfortunately, for some persons, or for some phases of the creative process, a negative mood is also helpful. Second, a predisposition to clinical depression is more common among creative writers and artists (but not scientists) than among the general population. This is not necessarily in contradiction to the first point. Creative episodes tend to occur as depression lifts and the person enters a mildly manic phase. This is the Aha! Or Eureka phenomenon. It has been little investigated for the simple reason that it is difficult to capture in a laboratory setting. Hence, it is poorly understood; or even misunderstood. Creative insights may indeed occur suddenly, as many anecdotal accounts illustrate; but so, too, do many nonsensical thoughts and imagery. For every dream that leads to a noble prize (as in the famous case of August Kekulé), numerous others lead nowhere and are quickly forgotten. In any case, most creative episodes do not happen in a moment, but require long periods of preparation (the equivalent of ten years of immersion in a subject is often cited). When a person has an inborn genius for certain emotions, his life differs strangely from that of ordinary people, for none of their usual deterrents check him (William James, 1902). Genius implies creativity the reverse, however, is not true. Many people can be creative without being recognized as geniuses. Everyone recognizes Einstein as a genius, and Beethoven and Picasso as giants in music and art. But an emotional genius? Names do not come readily to mind. Colloquially, emotions are often described as thoughtless, impulsive, immature, rigid or gut reaction. Such descriptors are seldom applied to creativity, which is typically ranked among the highest of the higher thought processes. Thus, the idea of an emotional genius does indeed seem to be an absurdity. By what criteria do we judge an emotional response as creative? Novelty and effectiveness (i.e., value) are the two most widely mentioned criteria for evaluating any response, emotional or otherwise, as creative. Whatever else it entails, authenticity implies that a response is consistent with a person’s goals and values. But more than that as a criterion for creativity, and authentic response involves a desire to get away from what is normal and ordinary for the purpose of being different. Put otherwise, if less eloquently, a creative response leaves room for further growth and development, whereas novelty may simply reflect an escape mechanism. Authenticity is relevant to creativity in any domain, but it is particularly important with respect to emotional creativity. Intense emotional reactions are often taken as ipso facto authentic. For this reason, emotional responses tend to give added credence to almost any experience, from the possible but unlikely eg., recollection of previously forgotten episodes of childhood sexual abuse to the outright implausible e.g., sexual experimentation by aliens while held captive on a space ship. Such experiences may be novel and even effective (at least in the short term, by giving meaning to a stressful experience occurring in the present); but would we judge them creative? Probably not, for they do not reflect the persons best interest or fundamental values, and they short-circuit rather than encourage fruitful development. Authenticity is important for another reason, namely, it helps account for cultural differences in judgments of creativity. In the West, with its emphasis on individuality, an authentic response also tends to be idiosyncratic to the individual and hence novel; in East Asian cultures, by contrast, where identification with the collective and its traditions is prized over individualism, authenticity is more easily distinguished from novelty (Averill, Chon, and Haan; 2001; Sundararajan and Averill, 2007). The first skill perceives emotions – the ability to detect and decipher emotions in things, arts, legends, and music including the ability to identify one’s own and others’ emotions. The second skill is using emotions to facilitate thinking- the ability to use or create emotion for attracting attention, conveying feelings or engaging in cognitive processes such as reasoning, problem solving, and decision making. The third skill is understanding emotions – the ability to comprehend emotional information, cause of emotion and the ability to recognize and describe how emotions evolve, combine and convert. The forth skill is managing emotions – the ability to be open to emotions and use effective strategies to promote understanding and personal growth. Two famous psychologists (Peter Salovey and John Mayer, 1990) have defined emotional intelligence as the ability to perceive emotions and affections to access and generate feelings in order to help better thinking and recognizing emotions and affections. In terms of personality, Gildford examines creativity and sees it as a set of capabilities and features that cause the person to think creatively. He considers creativity as problem solving or a set of large and small problems, and divergent thinking (to achieve new approaches to problem solving) vs. convergent thinking (to achieve correct answer) (Shah Hussein and Kavoosi, 2009). Sternberg (1989) defines creative thinking as a combination of innovation, flexibility and sensitivity to ideas enabling learners to think about different and productive results beyond irrational thinking leading to personal satisfaction and probably others pleasure. In structure of intellect model, Gildford described creativity as sensitivity to problems, fluency, new ideas, flexibility, originality, analysis and elaboration. Creativity is different in different people and is called everyday (public) creativity. 1. Personal barriers: the barriers arising from within the individual, such as fear of failure, avoidance of uncertainties, habits, lack of self-confidence and lack of flexibility. 2. External barriers: these barriers most originated from environment include law, business, customs, fear of social rejection and compliance with the fear of being different (Shah Hosseini, 2009). Emotional intelligence and its components result in specific skills such as creativity, self-awareness and empathy which are considered necessary for creative thinking. Creative thinking and move toward obtaining skills require the ability to tolerate frustration and ambiguity as well as delayed prosperity and satisfaction. Another characteristic of creative thinking is the ability to accept failure without self-confidence and motivation to continue searching for solutions being damaged characterizing emotional intelligence. According to many theories, creativity is a subset of emotional intelligence. Emotional intelligence enables one to increase or maintain a positive mood, thus increases creative thinking indirectly. Humanistic approaches in psychology consider creative thinking and performance as a tool for self-searching and achieving self-actualization. In their classic study, Maslow (1954) point to the importance of openness to experience, flexibility and endurance in a healthy personality; all three are considered as the characteristics of creative people. Alfred Bine believed that intelligence is a fundamental mentality, the change or lack of it is very important for scientific life of man. This mentality is judgment which is sometimes called common sense, intellect, initiative and ability to adapt to the situation. Good judgment, understanding, reasoning are fundamental activities of intelligence (Bine and Simon, 1905). In the modern society, emotional intelligence and its impact on managers’ success is one of the newest and most attractive research subjects in psychology which is one of success factors for all members of organizations. Managers coming to the area of education with this idea in mind that they should nurture diligent people and a healthy community seeking to achieve success and high academic rank through emotional intelligence. It is said that success and skill acquisition depend on multiple intelligence and emotional control (Aghayar and Sharifi Daramadi, 2006). Emotional intelligence has become a new concept in management and it seems that it is the missing part separating middle management from high performance management. There is no consensus about the nature and distinction of creative and critical thinking. Some consider them as identical without any differences. Others believe that they are completely independent and different. The third group considers them distinct but believes that there is a close relation between them making their recognition difficult. Perkinz suggests that creative thinking and critical thinking are not completely independent; in the process of good critical thinking there is creative thinking and creative thinking deals with critical improvement and improved outcome. Dialectical thinking is a set of bilateral creative actions in which there is a reciprocal relationship and one should put himself in the opposite position and engages in reasons for judgment and support of causes. Thus, there is no a clear distinction between critical and creative thinking because the correct idea involves the way of evaluation and production of a new issue. Creative thinkers examine created thoughts by expressing their benefits and validity and critical thinkers produce ways to test statements. Thus, the difference is not in kind but in the degree and emphasis on them. In contrast, Marzanov et al. consider critical thinking and creative thinking separated; however they believe that they are not contradictory and elsewhere they consider them very close and in many situations as the same. Marzanov writes that critical thinking and creative thinking both make judgments about the quality so they are similar in the goals and are discussed as a single dimension of thought which is necessary for obtaining good result in any effort. In his opinion, some experts see critical thinking and creative thinking as a process, because both require the use of multiple skills to produce a work or a product. Creative thinking can be classified into four elements of content knowledge, divergent thinking, and critical analysis and communication skills so there is no distinction between creative thinking and critical thinking. 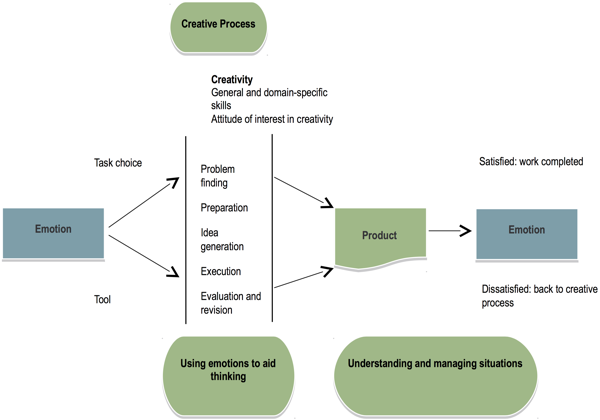 Hewitt believes that creative thinking is a process of critical thinking and correct thinking requires both thinking. He considers critical thinking as evaluation and creativity as combination. Humanistic approaches in psychology consider creative thinking and performance as a tool for self-searching and achieving self-actualization. In their classic study, Maslow (1954) point to the importance of openness to experience, flexibility and endurance in a healthy personality; all three are considered as the characteristics of creative people. Hence, creativity is associated with autonomic ego and autonomic ago provides the ability to deal with the life situations so creativity can make one resistant to mental damages. Emotional intelligence abilities have a role throughout the creative process, from finding important problems, to coming up with original ideas and persisting in solving problems despite frustration or obstacles. Figure 2 depicts the role of emotions and emotional intelligence abilities in the creative process. The model starts with the assumption that the key to creative production are traits, attitudes, and skills, such as openness to experience, beliefs about the importance of creativity, and a commitment to creativity. When these traits, attitudes, and skills exist, emotions can be tools and motivators of creativity and they can direct people’s actions. More often, working around constraints leads to creativity. For instance, Getzels and Csikszentmihalyi (1975) set up an art studio in their laboratory at the University of Chicago and invited art students to create still-life drawings by choosing from among 30 available objects. The researchers observed the artists as they picked out objects, arranged them and completed the drawings. Some artists spent more time than others picking up the objects, feeling their weights and textures, and trying to work mechanical parts of the objects. Researchers called this process problem finding – artists spent time playing with objects and ideas of what to draw before they committed to a specific still life. These artists remained open to how they would structure the still life and delayed making a decision about what to draw. In the end, the artists who spent the most time problem finding made the most creative drawings. Engaging in prolonged problem finding can be emotionally challenging. The unknowns of what to work on or how to approach a task are often disconcerting. People differ in how much of this discomfort they are willing to endure. Psychologists call this willingness to endure uncertainty “tolerance of ambiguity” and find that it is closely related to creativity (Helson and Pals, 2000; Lubart and Sternberg, 1995). Emotionally intelligent individuals can anticipate the emotional discomfort during problem finding, but are also better able to cope with these feelings. In a fast moving world where most people work on multiple projects with significant time constraints, substantial skill is needed to manage anxiety in the face of deadlines and allow oneself time for problem finding and idea exploration. Emotional intelligence abilities are also necessary to transform emotions into motivators of creative activity. For example, boredom can lead to a desire for passive entertainment or even destructive behavior, such as drug use (Csikszentmihalyi, 1993; Hunter and Csikszentmihalyi, 2003). Another way that people can use emotions to help creativity is by matching their emotional state to the tasks that would benefit from a certain mood. People in sad moods tend to think more critically; thus, sad moods can help with tasks that require critical and analytic thinking. On the other hand, people in happy moods are better able to quickly come up with interesting and playful ideas; thus, happy moods can help with brainstorming tasks that require original thinking in a short amount of time. In a series of studies, Cohen and Andrade (2004) demonstrated that some people consciously match their moods to benefit the tasks they face. They brought university students into the lab and showed them various video clips to make them experience different emotions. Participants were then either told they would be performing a task requiring precise analytic thinking or a task generating creative and imaginative ideas. Participants were given a choice to listen to happy or sad music before working on these tasks. By listening to music, people could make their mood either more positive or more negative. Many people decided to listen to upbeat music when they were told they would work on a brainstorming task and sad music when they were told they would work on an analytical task. This study showed that people do not manage their moods only to make them more positive, but that they also consider how useful different emotions are for what they have to do. Some people decided to change their nitial mood and make it more negative because sad moods are helpful in performing critical thinking tasks. Others chose to make their mood more positive because happy moods can help with generating original ideas. However, not all people matched their emotions to the tasks awaiting them, demonstrating that not everyone has an understanding of which moods benefit different tasks. The theory of emotional intelligence posits that individuals who have the ability to use emotions to help thinking understand the influence of moods on performance and can apply this understanding in their work (Salovey, Mayer, and Caruso, 2002). By intentionally choosing to work on tasks that require critical evaluation or editing for quality in sad moods and tasks that require coming up with new ideas in happy moods, people should be able to complete their tasks more successfully. After engaging in a creative task, people can feel a range of emotions, and these emotions can signal future actions. Emotions related to satisfaction signal that the creative process is over; the person solved a problem and feels good about the solution. Alternatively, emotions related to dissatisfaction or anxiety can signal that there is a problem and direct one back to the creative process. If the frustration or anxiety is too high, the person may choose to give up rather than return to the creative process. The skill of accurately labeling one’s feelings and understanding the source of those emotions is helpful in this process. For example, imagine a teacher who feels frustrated at the end of each school day. If she has the ability to understand that her frustration is a result of not having all the students engaged and participating in class, she will act differently than if she cannot identify the source of her frustration. If she decides to approach this problem creatively, she can generate possible solutions to engage students. She thinks of many solutions but decides to try offering stickers each time students raise their hands. After a few weeks there are no changes in students’ participation. The teacher continues to feel frustrated. Finally, the teacher pairs disengaged students with those who are struggling and students become more engaged when they feel responsible for helping others. The teacher was able to use her frustration as motivation to identify a problem and also to continue working on the problem until it was resolved successfully. Pablo Picasso talked about artists being receptacles for emotions and vehicles for transforming emotions (Picasso, 1988). Similarly, the renowned director Stanley Kubrick likened film to music in that they both should be a progression of moods and feelings to which the theme and meaning are added later. Emotions are central to all art forms, from painting and sculpture, to music, film, theatre and other arts. For some artists, this process might be unconscious and feel automatic or natural. However, emotional intelligence skills can be taught, practiced and developed (Brackett, Rivers, Reyes, and Salovey, 2012; Rivers and Brackett, 2011) and people can learn how to deliberately use their emotions as aids in the creative process. Engagement with the arts, both as art appreciation and art creation, can be a powerful teaching tool in increasing emotional intelligence abilities and creativity in one’s everyday and professional life. This is the thesis central to the mission and philosophy of the Botín Centre and it is a thesis that will motivate the development of educational programs and the research on their effects. In collaboration with the Botín Foundation and the Botín Centre, researchers at the Yale Center for Emotional Intelligence are designing a series of workshops for children and adults using the arts as a teaching tool. Different educational programs will use visual arts, music, acting and other art forms to build creativity-relevant skills. For instance, unlike a usual trip to the museum, where people might look at each artwork for just 30 seconds, the workshop participants will be asked to look at a single work of art for a minimum of 10 minutes. People will be challenged to examine details of content, structure, composition, and color. They will be asked to explore the work of art from different perspectives, angles and distances. People will be encouraged to imagine themselves inside the work of art, thinking about the sights, sounds, smells and feelings that they would experience if they were literally inside it. Noticing details and creating a rich picture of the artwork will be then applied to learning about emotions and creative work. This simple technique of deep observation and entering into a work of art is a common tool used by eminent creators across the arts and non-artistic domains (Root-Bernstein and Root-Bernstein, 1999, 2004). Successful actors, for instance, are able to identify with a character they are portraying and not only understand the character’s emotions but also feel them as their own. Innovators in other fields also use this technique, from the animal scientist Temple Grandin who observes the world from the standpoint of cows and sheep as she is designing animal corrals, to medical doctors who devise optimal treatment plans for individual patients. Applied educational work is the realization that observation skills are key to both developing emotional intelligence and creativity. The arts provide a suitable medium to teach people about emotions and creativity. Works of art – from paintings, sculptures, pieces of music, to dance and dramatic arts performances – convey emotion and are themselves a result of the creative process. While talking about one’s own emotions is highly personal and uncomfortable for some individuals, works of art provide subject matter that is located outside of the person. The arts, therefore, provide the space for emotions to be examined in a psychologically safe manner. Even individuals who are concerned about the negative social consequences of exposing themselves emotionally will be able to engage in educational activities that employ the arts as a teaching tool. Creative work is usually complex and difficult. There are dead ends and false starts. It is also related to a number of emotional traits. Emotional intelligence enable a person to become aware of relationships between mood and performance and to direct their efforts into activities best suited for certain emotional states. It gives ability to a person to maintain or increase positive moods and can thus indirectly be involved in enhancing creative thinking. Alternatively, Emotional intelligence might moderate the relationship between emotional traits and creativity. It is conceivable that emotional abilities play a significant role in creativity only when the products express emotional content. Aghayar, C., & Sharifi Daramadi, P. (2006). Emotional Intelligence. Tehran: Sepahan Press. Antonacopoulou, E.P. and Gabriel, Y. (2001). Emotion, learning and organizational change: Towards an integration of psychoanalytic and other perspectives, Journal of Organisational Change Management, 14(5), 435-451. Averill, J.R., Chon, K.K., & Haan, D.W. (2001). Emotions and creativity, East and West. Asian Journal of Social Psychology, 4, 165-183. Amabile, T.M. (1996). Creativity in context: Update to the social psychology of creativity. Boulder, CO: Westview. Ashforth, B.E. & Humphrey, R.H. (1995). Emotion in the workplace: a reappraisal, Human Relations, 48(2), 97-126. Averill, J.R., & Thomas-Knowles, C. (1991). Emotional creativity. In K. T. Strongman (Ed. ), International review of studies on emotion (Vol. 1, pp. 269–299). London: Wiley. Brackett, M.A., Rivers, S.E., Reyes, M.R., & Salovey, P. (2012). Enhancing academic performance and social and emotional competence with the RULER feeling words curriculum. Learning and Individual Differences, 22, 218-224. doi:10.1016/j.lindif.2010.10.002. Binet, A., & Simon, Th. A. (1905). Méthode nouvelle pour le diagnostic du niveau intellectuel des anormaux. L’Année Psychologique, 11, 191-244. Barron, F.X., & Harrington, D.M. (1981). Creativity, intelligence, and personality. Annual Review of Psychology, 32, 439–476. Csikszentmihalyi, M. (1993). Activity and happiness: Towards a science of occupation. Journal of Occupational Science, 1, 38-42. doi:10.1080/14 427591.1993.9686377. Cohen, J.B., & Andrade, E.B. (2004). Affective intuition and task-contingent affect regulation. Journal of Consumer Research, 31, 358-367. doi:0.1086/422114. Doorewaard, H. & Benschop, Y. (2003). HRM and organisational change: an emotional endeavor, Journal of Organisational Change Management, 16(3), 272-286. Feist, G.J., & Barron, F.X. (2003). Predicting creativity from early to late adulthood: Intellect, potential, and personality. Journal of Research in Personality, 37, 62–88. Fineman, S. (1997). Emotion and management learning, Management Learning, 28(1), 13-25. Fiske, S.T. & Taylor, S.E. (1991). Social cognition (2nd edn. ), McGraw Hill, New York. Forgas, J.P. (1991). Emotion and Social Judgements, Pergamon Press, Oxford. Frijda, N.H. (1988). The laws of emotion, American Psychologist, 43, pp.349-358. Greenberg, J. & Baron, R.A. (2002). Behavior in Organizations, Prentice Hall, New Jersey. George, J.M. & Jones, G.R. (2001). Towards a process model of individual change in organisations, Human Relations, 54(4), pp. 419-444. Greenberg J. & Baron A.R (2000). Behaviour in Organisations, Prentice Hall, Vol. 8, pp. 188-215. Goleman, D. (1995). Emotional Intelligence. Bantam, New York. Giddens, A. (1984). The constitution of society, University of California press, Berkeley. Getzels, J.W. & Csikszentmihalyi, M. (1975). From problem solving to problem finding. In I. A. Taylor & J. W. Getzels (Eds. ), Perspectives in creativity (pp. 90-117). Chicago, IL: Aldine. Helson, R., & Pals, J.L. (2000). Creative potential, creative achievement, and personal growth. Journal of Personality, 68, 1-27. doi:10.1111/1467-6494.00089. James, W. (1902). Varieties of religious experience. New York: Collier Books. Kaufman, J.C., & Beghetto, R. A. (2009). Beyond big and little: The four c model of creativity. Review of General Psychology, 13, 1-12. doi:10.1037/a0013688. Kunda, Z. (1999). Social Cognition: Making Sense of People, The MIT Press, Massachusetts. Lubart, T.I., & Sternberg, R.J. (1995). An investment approach to creativity: Theory and data. In S. M. Smith, T. B. Ward, R. A. Finke (Eds. ), The creative cognition approach (pp. 269-302). Cambridge, MA: MIT Press. Mayer, J.D., Salovey, P., & Caruso, D. (2002). The Mayer-SaloveyCaruso Emotional Intelligence Test (MSCEIT). Toronto, Ontario: Multi-Health Systems. Maslow, A.H. (1954). Motivation and personality. New York: Harper & Brothers. Picasso, P. (1988). Picasso on art: A selection of views. New York, NY: Da Capo Press. Rivers, S.E., & Brackett, M.A. (2011). Achieving standards in the English language arts (and more) using The RULER Approach to social and emotional learning. Reading & Writing Quarterly, 27, 75-100. doi:10.108 0/10573569.2011.532715. Root-Bernstein, R., & Root-Bernstein, M. (2004). Artistic scientists and scientific artists: The link between polymathy and creativity. In Sternberg, R. J., Grigorenko, E. L., & Singer, J. L. (Eds. ), Creativity: From potential to realization (pp. 127-151). doi:10.1037/10692-008. Root-Bernstein, R., & Root-Bernstein, M. (1999). Sparks of genius: The 13 thinking tools of the world’s most creative people. Boston, MA: Houghton Mifflin Company. Shahhosseini, A & Kavoosi, E. (2009). Innovation and Entrepreneurship, 1, Tehran: Aeeizh. Sundararajan, L., & Averill, J. R. (2007). Creativity in the everyday: Culture, self, and emotions. In R. Richards (Ed. ), Everyday creativity and new views of human nature (195-220). Washington, DC: American Psychological Association. Salovey, P., & Mayer, J.D. (1990). Emotional intelligence. Imag. Cog. Personal. 9: 185-211. Sternberg, R.J. (1989). Social intelligence and decoding of nonverbal cues. Intelligence, 13, 263–287. Weiss, H.M. & Cropanzano, R. (1996). Affective events theory: a theoretical discussion of the structure, causes and consequences of affective experiences at work, In B.M. Staw and L.L. Cummings (Eds.) Research in Organisational Behavior, JAI Press, Greenwich.